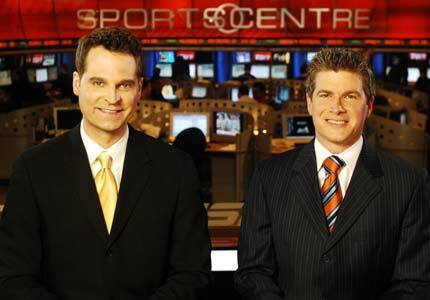 TSN's Jay Onrait (left) and Dan O'Toole have been just two of the highlights of the Consortium's Olympic coverage. Whether it’s bitter Australians or sniping Brits, the 2010 Olympics media coverage has become a story unto itself, becoming a sideshow to the actual competition. In Canada, the media controversy du jour is that the Olympics are being covered by the Consortium - a group of companies that includes CTV, the Globe and Mail, Rogers and my employers, the Canadian Press amongst many others – and not the Canadian Broadcasting Corporation. Many people have criticized CTV’s coverage, saying that the CBC is the broadcaster of choice. Personally, I’m not so sure. Student of Canadian television that I am, I think it’s time to see just how CTV’s posse has been doing. More channels, more sports. The CTV/CHUM/City/Rogers hydra has six channels available for Olympics broadcasting, meaning that there is no need for anyone to miss their favourite event. They’ve also done a good job of rolling a banner out informing the viewers when other events are starting on other channels. This isn’t just good for the viewers, it’s good for the sports. Events like women’s hockey are getting more exposure than ever before, and it’s actually possible to watch an entire day’s worth of competition without the feed switching to biathlon or something. Hopefully this means that in the long run we’ll see growth in sports that have suffered on the fringes of cable television. APTN. One of the channels in the Consortium is the Aboriginal People’s Television Network, a channel up in the high stratosphere of cable TV. They haven’t been given the biggest events to cover, but the fact that they’re providing coverage specifically for Canada’s First Nations is admirable. Many Canadian athletes are of native descent, and having a dedicated Olympic channel that caters to them is long overdue. Hopefully, they’ll maintain their license for the foreseeable future. James Duthie. Okay, not just Duthie, but many members of the TSN crew. Anchors like Dan O’Toole, Bryan Mudryk and Jay Onrait have been given a bigger stage to perform on, and they’ve done a fantastic job of keeping even mundane recaps entertaining. Too often the Olympics are sincere to the point of being maudlin and these four TSN veterans have injected a much-needed sense of fun to the proceedings. Duthie in particular, has used his dry wit to great effect. The lead-up to the opening ceremonies stands out. When everyone else seemed dazzled by the spotlight, Duthie was quipping about Brian Williams and Lloyd Robertson doing body shots together. It’s rare that a television personality can crack up their co-host on screen. More channels, more problems. As I said above, having more sports available on more channels is a good thing. Unfortunately, it hasn’t always been well executed. On the CTV Olympics website and on TV the Consortium has posted times for events without specifying which time zone. I know several people who’ve been thrown off by the start times of big matches or performances that have been wrong simply because CTV neglected to mention whether it was Eastern or Pacific time. Canada is a big country with six time zones. CTV should make it easy on their viewers by at least throwing them a point of reference on which zone they’re talking about. Green commentators. As strong as the TSN staff have been, there have also been some cringe-worthy commentators. A new conglomerate providing coverage for six channels, 24 hours a day means that many of the play-by-play people and colour analysts are pretty raw. They’re either new to the sport or new to broadcasting. This has created all kinds of bumps and hiccups that are distracting and sometimes confusing. Also, with content spread significantly thinner, some commentary teams have clearly struggled to fill air time. Normally I think Jamie Campbell is a fine sportscaster, but during the men’s snowboard cross time trials he was clearly at loose ends, resorting to quoting Led Zeppelin lyrics. You can do better than that Mr. Campbell. The preamble to the opening ceremonies was particularly rough, with everyone at loose ends trying to fill airspace. Only Duthie shone at this point, thanks to his years of experience on TSN. MuchMusic. The weakest of the Consortium channels, my first glimpse of MuchMusic’s Olympic coverage was when CTV briefly switched to their feed in the lead up to the opening ceremonies. VJ Tim Deegan was sitting in a hot tub with three young ladies who could have been 12 years old. In Much’s indoor set, two girls took body shots off of some guy’s chest. Then the viewer was back out with Tim-in-the-Tub, where two young men stripped off their clothes in a rousing round of “Drop your Gear for Beer”. I don’t know who won the contest because just as one of the young men put his hand on the waistband of his boxers CTV cut back to their shell-shocked anchors at the International Broadcast Centre. I haven’t ventured back to Much since. Not to sound like a cranky old man, but that is awful. I like the idea of dedicating a channel to the cultural events surrounding the Olympics, but, you know, how about some culture that didn’t involve getting drunk and/or naked. All in all, I’d say that the Consortium’s television coverage got off to a rocky start but has improved each day. Many of the broadcasting hiccups, like warm weather, broken Zambonis and delayed events, are beyond their control. Their commentators are becoming more comfortable on air and the production crew is clearly finding their rhythm. Also, MuchMusic is staying on its own channel. CTV has chosen an incredibly ambitious project to sink their teeth into, and at times it looks like they’ve bitten off more than they can chew. However, the second week promises to be a smoother ride. What's your take? Anything you've liked about the coverage? Disliked? Please leave a comment!